Suitable for fresh fodder, silage or hay. Lawrence Pearl Millet, like Japanese millet, sorghum and sorghum-Sudan grass, is an annual, semi-arid tropical grass plant grown for grain and forage throughout the tropical world. Until recently there were no varieties of pearl millet that could be grown under the cool temperate conditions of Southern Australia. Lawrence is a new semi-dwarf cultivar of pearl millet that has the ability to produce high yields of forage over a relatively short growing season. 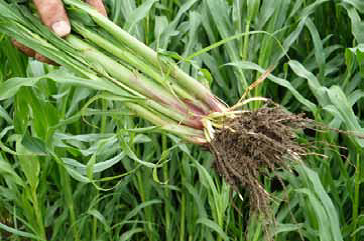 It grows rapidly and can be cut or grazed 6 to 8 weeks after planting, (or about 1 metre high). Although yields are similar to Sudan Grass, Lawrence Pearl millet has a slightly higher feeding value compared to Sudan grass or temperate millets and does not run to head in hotter dry weather the way temperate millets do. Forage Pearl millet tends to have a smaller stem than sorghum grasses. As with any forage, stage of cutting will impact on the quality. Lawrence can be used for fresh fodder, pasture, silage and even hay, when properly conditioned. Lawrence establishes best on fertile well drained soils and does not have the same nutrition requirement as Sorghum. It can be sown into poorer sandy soils where it is supported by good nutrition. Lawrence requires irrigation or good underlying soil moisture through the growing period. Lawrence is very sensitive to frost, therefore should not be planted too early. Planting into a firm moist seed bed is important for successful establishment. A soil temperature of 15°C and rising is recommended for faster germination. N 30 kgs; P 8 kgs; K 30 kgs plus trace elements. Lawrence provides a high tonnage of silage with very acceptable nutritive values. Data from other countries show forage pearl millet overall produces higher yields than maize and grain sorghum, and similar tonnage compared with forage sorghum. When properly cured pearl millet produces excellent hay. Lawrence has excellent regrowth potential due to its tillering responses to defoliation. Prussic acid toxicity is not present in pearl millet, and it makes high quality forage for beef cattle, dairy cows and sheep. Allow livestock to graze it down to 10-15 cm then remove. Further, allow plants to grow to 50-60 cm before re-grazing. Rotational or strip grazing is recommended.